I'm a big fan of Fantasy and the universe of Dungeons and Dragons always captivated my curiosity. In that line of thoughts the Dragonlance Saga was something that I needed to investigate and with a little bit of research in the internet about the “order to read” I started with the Dragonlance Chronicles being the first volume of that trilogy the Dragons of Autumn Twilight. In reality I bought the Omnibus version of the Chronicles but I decided to do the reviews individually anyway. And sincerely it was a real pleasure reading the adventure of the companions in this first book. Tanis Half-Elven a half-elf and the leader of the group, Sturm Brightblade one of the last Knights of Solamnia, Goldmoon Chieftain Daughter of the Que-Shú tribe and the first true cleric of good since the Cataclysm always accompanied by her lover Riverwind also a barbarian of the same tribe, Caramon Majere a strong warrior and is twin brother Raistlin Majere a Mage of the Red Robes, Flint Fireforge a gruff old dwarf and old friend of Tanis and finally but not less important Tasslehoff Burrfoot a happy-go-lucky not so innocent kender. Yeah! A big group and with bigger adventures in front of them because Krynn the world were this stories take place is once again – since the Cataclysm era – threatened by the forces of Evil Dragons, Dragon Highlords and the Queen of Darkness their leader to the destruction of Krynn. 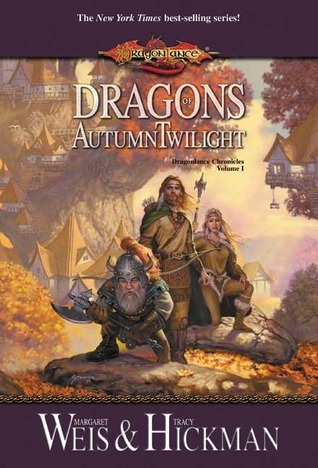 In resume Dragons of Autumn Twilight treats three major points: the introduction of the heroes (their personality, motivations, back stories…), the encounter of Goldmoon and the journey she as to make to become a cleric of the Goddess of Good Mishakal and the first time the companions fight directly the forces of evil – in this case Verminaard the Dragon Highlord in Pax Tharkas and Pyros a Evil and powerful red dragon. For me all these characters were memorable in the end of the book, I didn’t just forget them in the turn of the last page and that shows how engaging all they were for the story. The good points for me in Weis and Hickman writing is the well passed action, the opportunity to view the point of the various characters and the way they construct the good ones and the bad ones. Some people told me that for their tastes it was a stereotypical story with stereotypical characters and to them I said and what’s the problem? Because for me literature genres like Fantasy or Sci-Fi will always have characters or plots that we can identify with in more than one story that’s the cause behind of it being a literature genre. And in this particular case I just loved it and had really fun for the reason that I simply admire the constructs behind the characters and can see pass their races and fighting styles associated with the games and board games released before the stories. So I’m excited to begin the second book Dragons of Winter Night.